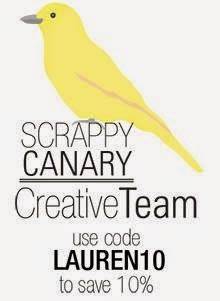 Lauren here! I hope that you have all had a great weekend and if you are in the states in Australia that had a public holiday I hope you took advantage of the long weekend (I know I did)! Although March is still meant to be warm this time of year, I am currently sitting on the couch writing this post with a blanket, tea and the heating on! The joys of country living! I am absolutely loving the February kits! How awesome are they? I have been having so much fun working with the February Pocket Life Kit - Courageous! 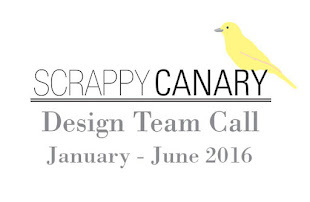 Every month we have an awesome Sketch Challenge here at Scrappy Canary - we love to see your entries and every entry is in contention to win a $10 voucher to the Scrappy Canary store. To find out more information visit the March Sketch Challenge blog post. Today I am going to show you my take on the March sketch using only the Pocket Life kit, card stock and my gelatos! Just because it is a Pocket Life Kit doesn't mean you are limited to pocket pages - Pocket Life cards are perfect for traditional scrapbooking, which is what I have done today. Gelatos are kind of like a cross between a pastel and a water colour I suppose. I decided to use them on the white card stock as a background. First thing first was to find the perfect colour that matched the My Minds Eye On Trend Journalling Cards. I did some samples and I eventually went with a peach colour that I blended with my finger using a mixture of orange and white. Gelatos are great as they allow you to create an ombre colour. I then trimmed two piece of card stock. I used kraft which I then matted onto white. I distressed the edge of the white card stock and then ran the orange and white Gelatos over the distressed edges to add some more colour. The MME On Trend photo overlays were great and I decided to mount the 'our story' overlay on white card stock. As this page will be an insert into Week 1 of 2015 I really wanted to highlight the direction my husband and I want our year to go. Using the On Trend stickers (letters and the gold triangles), along with the white Simple Stories stickers and the Pretty Little Studio labels I defined where I thought the year should head! I used dimensional dots to raise 'our story' and the label to add depth to the layout. Distressing the edges of the card stock also added extra dimension. To create the squares I used the 3x3 journalling cards from the MME On Trend pack. I also added a 2015 photo, plus a photo of us. I really want project life to document 'our story'. The sketch showed three embellishments on it. I loved the butterfly that was on one of the Simple stories 4x6 Journal Card Elements, so I fussy cut it out and added a dimensional dot so I could raise the wings of the butterfly. I am so happy with how this layout turned out - I hope that it demonstrates how great 2015 is going to be for us! We certainly deserve a great year! 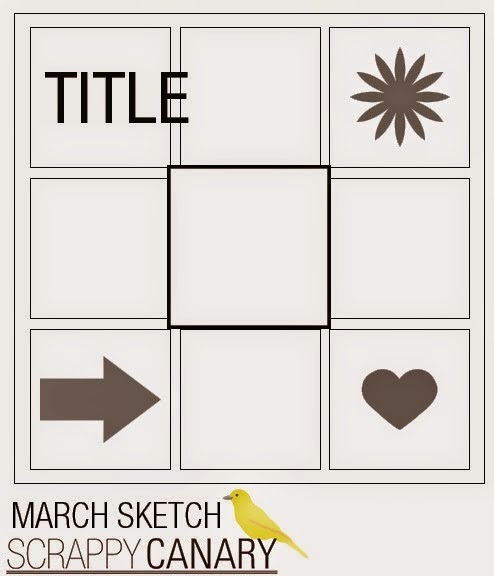 All of us at Scrappy Canary would love to see your take on the sketch, so make sure that you enter the March Sketch Competition!